Turn your basement into any kind of room you can imagine - a den is just one example! How much does it cost to finish a basement? When you choose to have Total Basement Finishing remodel or finish your basement, you've made a decision to install products that will make your basement beautiful, and keep it that way for a long time to come. The goal of Total Basement Finishing is to renovate basements with quality products specifically made for the basement environment that will maintain their original level of quality for decades. While there are cheaper alternatives on the market, we've researched, designed, and developed the products specifically for finishing basements that we believe offer the most value for your investment. To get started on your basement finishing needs, contact your local TBF dealer today! We offer free estimates for all of our services across the country. Basements come in all sizes and shapes - some have rooms, others have partitions, and they all have different layouts for support beams, pipes, water heaters, and furnaces. When we finish the basement, there are a wide variety of ways we can finish your basement by adding rooms, combining products, and possibly leaving a section of the basement unfinished. To put it simply, no two basement finishing jobs are alike. We would love to give you the price that it would cost to finish a basement, but as every job is custom, and there are a variety of products to choose from, this is not an easy task. With questions like: How big is your basement? How many rooms do you want? Do you want a bathroom? What appliances and conveniences do you want? What type of basement flooring do you want? etc. You can see why it's not a simple task to price the remodeling of a basement. Total Basement Finishing would like to send one of our basement finishing specialists to visit your home and assist you in deciding the best plan for your basement. All of our representatives are trained at our national headquarters to ensure that the service you receive is professional and of high quality. All of our Remodeling Design Specialists are prepared to conduct a personal assessment of your basement and make recommendations on the best options for your basement remodeling project. We have a variety of options for your basement flooring, basement walls, basement ceiling and basement windows. Call or contact us online for a Free Design Consultation and Quote. If you decide that you'd like to add living space to your home by finishing your basement, our Remodeling Design Specialists are ready to help. 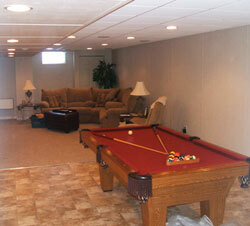 Making a basement remodeling plan and coming up with basement finishing ideas is fun to think about! You can add an in-law's suite, personal gym, wine cellar, basement library, extra kitchen, children's play area, private office, family room, game room, home theater, personal spa, arts and crafts room, wet bar, billiards room, extra basement bathroom, or any extra room you can imagine to your home! Total Basement Finishing is the perfect way to make your damp, ugly, and cold basement into a beautiful, mold-free, dry living space that your family will love to spend their time in. When your specialist visits, he can explain to you how finishing the basement increases the value of your entire home! Once you've decided on the best way to remodel the basement, your local TBF basement remodeler can draw up a proposal for you and discuss the price of the final basement remodeling system. The representative can give you a date when the installation should begin and a reliable estimation on how long the job should take to complete (an average job should take five to ten days). Whether you choose to do the job or not, the consultation and estimate are free- there's no obligation at all! If you've been thinking about renovating your basement, making your home more energy-efficient and adding value to your home, Total Basement Finishing can help. Give us a call or contact us online today!